Mettler Toledo, Model PWRD FENCE. Stainless steel, table top conveyor. Equipped with a 50" wide x 77" long Intralox belt powered by a .75 Hp drive and mounted on (4) leveling legs with an infeed / discharge range of 31" to 39"
Mettler Toledo, Model XC checkweigher. Rated from 25 to 100 products per minute. Product weight range: up to 3,000g. Accuracy: ± 0.5g. Equipped with 10" long x 7¾" wide Neoprene infeed conveyor, 10" long x 7¾" wide load cell conveyor and 10" long x 8" wide discharge conveyor. Touch screen controll panel. Mounted stainless steel base frame with leveling pads. Speed and accuracies dependant on materials, application, machine configuration and environment. Mettler Toledo, Model XC, automatic, checkweigher. Rated from 25 to 100 products per minute. Product weight range: up to 3,000g. Accuracy: ± 0.5g. Equipped with 10" long x 7¾" wide Neoprene infeed conveyor, 10" long x 7¾" wide load cell conveyor and 10" long x 8" wide discharge conveyor. Touch panel controller. Mounted stainless steel base frame with leveling pads. Speed and accuracies dependant on materials, application, machine configuration and environment. Mettler Toledo Model XE, automatic, checkweigher. Rated from 50 to 200 products per minute – depending on materials, application and machine configuration. Product weight range: up to 1,000g. Accuracy: ± 800mg. Equipped with 10" long x 7¾" wide Neoprene infeed conveyor, 10" long x 7¾" wide load cell conveyor, 16" long x 8" wide Intralox discharge conveyor with adjustable guide rails and airblast reject. Control panel has a touch screen controller with readout. Mounted stainless steel base frame with leveling pads. Safeline, R Series H4, automatic metal detector rated up to 100 feet per minute – depending on materials and application. Aperture: 4" in Height; 25" in Width. 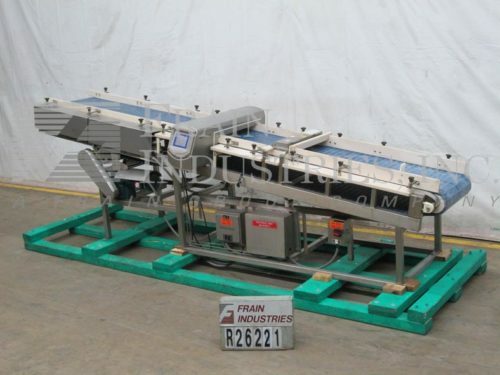 Equipped with 174" long x 24" wide flex link conveyor with width adjustable guide rails, Sensitivities: depending on product, container and enviorment being run in. 23" x 5" x 2" Eriez magnetic trap bar, retracting nose reject, and a touch pad operator interface with visual display. Mounted on a stainless steel frame with an infeed of 30" and a discharge of 53".